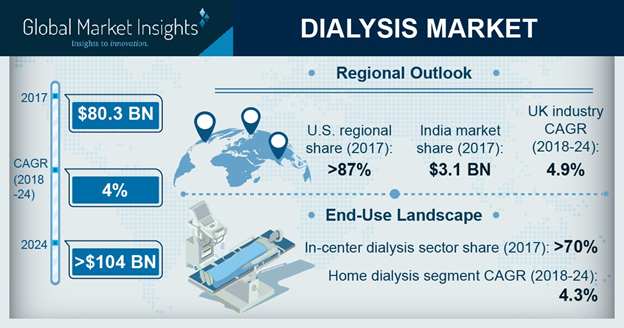 Dialysis Market size is set to exceed USD 104 billion by 2024; according to a new research report by Global Market Insights. Increasing prevalence of diabetes that ultimately affects kidney functioning will escalate the demand for dialysis treatments. Emerging economies such as India have high prevalence of obesity and diabetes. Around 50 million people in India suffer from diabetes and majority of them suffer from kidney disorders that will augment dialysis industry growth over the forecast timeframe. Additionally, favorable reimbursement scenario developed by insurance providers for supporting dialysis treatment will positively influence dialysis industry growth in forthcoming years. Growing R&D activities and expenditure by companies such as Nipro, Fresenius Kabi, Baxter will add innovations in new dialysis device. For instance, in June 2017, in China Nipro planned to increase production of filters that are used in dialysis treatment . This will increase the demand for technologically advanced dialysis product that will ensure dialysis market growth over the forecast period. However, product recalls are a major concern that may restrain dialysis industry growth during the analysis timeframe. Hemodialysis segment will witness 3.8% CAGR over the forecast timeframe and the segmental growth will be attributed to increasing mortality rate due to kidney failure. Moreover, availability of superior quality hemodialysis product and services augments business growth. Consumables segment was valued at USD 10.3 billion in 2017 and is anticipated to grow considerably over the estimated timeframe. Consumables such as dialyzers, catheters and access products need replacement at regular intervals. Contaminated consumables such as reused AV fistula needles may pose a great threat to life. Therefore, mandatory replacement of consumables has increased their demand thereby, escalating business growth. Home dialysis segment accounted for 29.1% revenue share in 2017 and the segmental growth can be attributed to the growing geriatric population that suffers from chronic kidney diseases. According to National Kidney Foundation, around 10% of the global population is affected by chronic kidney diseases and majority of them constitute of geriatric population. Home dialysis is affordable and also provides ease and convenience that increases its preference and will upsurge the dialysis industry growth over forthcoming years. U.S. dialysis market dominated North America region and was valued at USD 24.0 billion revenue in 2017 and the high revenue can be attributed to the growing geriatric population suffering from various renal diseases. End stage renal disease (ESRD) requires kidney transplantation or dialysis treatment. Shortage of kidney donors will surge the demand for dialysis treatment in dialysis centers or home setting. Moreover, presence of major industry players in the U.S. coupled with advanced healthcare infrastructure will further boost the regional growth. UK dialysis market is estimated to witness lucrative CAGR of 4.9% over the analysis timeframe, owing to the rising prevalence of chronic kidney diseases (CKD) in the country. According to the Kidney Care UK, around 3 million people in the UK suffer from CKD. More than 3,000 kidney transplants take place every year. Such factors will increase the demand for dialysis treatment thereby fostering the regional growth. Prominent industry players operational in the dialysis market include Asahi Kasei Corporation, B. Braun Melsungen, Baxter International, Fresenius Medical Care, JMS, Kawasumi Laboratories, Medtronic, Nikkiso, Nipro, Toray, DaVita, U.S. Renal Care, Satellite Healthcare and Rogosin Institute. These industry players implement certain strategic initiatives such as new product launch, mergers and acquisitions that help them in maintaining their market position. For instance, in August 2017, B. Braun launched Diacap Pro, a new dialyzer, with improved cleaning performance and user handling. The strategy aimed at enhancing company’s product portfolio and broadening its customer base.